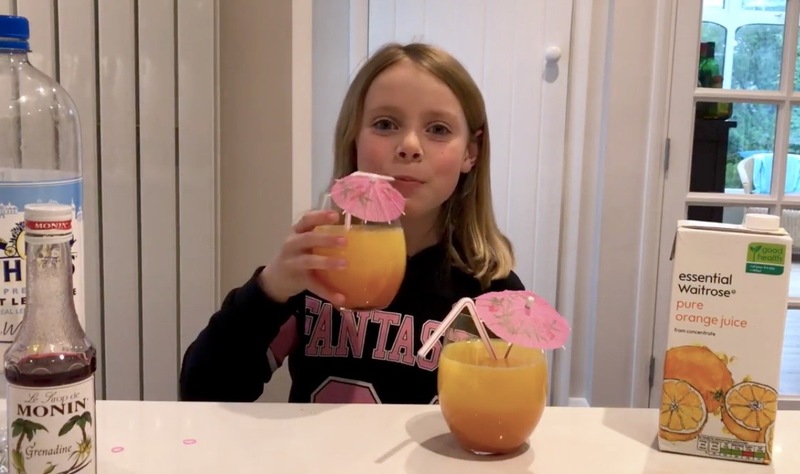 My nine-year-old made mocktails at school last week. It was part of her English lesson to help with understanding instructional texts. She was so excited about doing them at school that she had to make them at home too! Get your glasses ready – both highball glasses or tumblers work. Carefully cut slices of orange ready to decorate the glasses (Sofia missed this bit out! 🙂 ). Fill each glass about one third of the way up with the orange juice. Add the lemonade, filling it almost to the top of the glass. Slowly pour a small amount of grenadine into each glass. The grenadine will sink to the bottom and form the pinky red layer. Add an orange slice to the side of each glass for decoration. Add a paper straw and/or some cocktail umbrellas and serve. * For a classic Tequila Sunrise it’s: six parts orange juice, three parts Tequila and one part Grenadine. Serve with an orange slice and a glacé cherry or two. Take the tops off of four of the nine strawberries and then chop them into small pieces. Sprinkle the finely chopped strawberry pieces on the top. Cut the remaining strawberries in half and add to the tops of the glasses as a garnish.